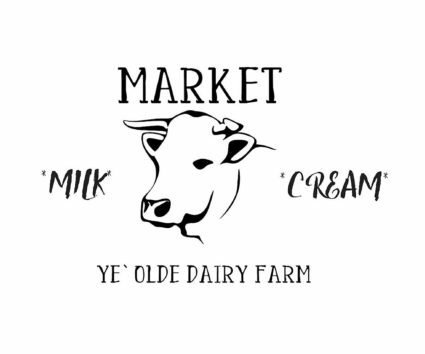 I’m Kate from Farmhouse38 and I’m loving the chance to welcome you to our little faux farm in the city. We bought our 105 year old home after it had sat abandoned for nearly six years, and because it has been quite the renovation process (my definition of ‘challenging’ has been readjusted several times over now), I thought I’d give you all a ‘Before and After’ tour. It was obvious that the place desperately required some curb appeal, and my displaced-Texan husband knew he required a front porch where he could do some ‘front porch sittin’ ‘. Oh, and a front door. It kind of needed a front door. Minor detail. Inside, the before ‘living room’ was arguably the only room in the house that was ‘not bad’. 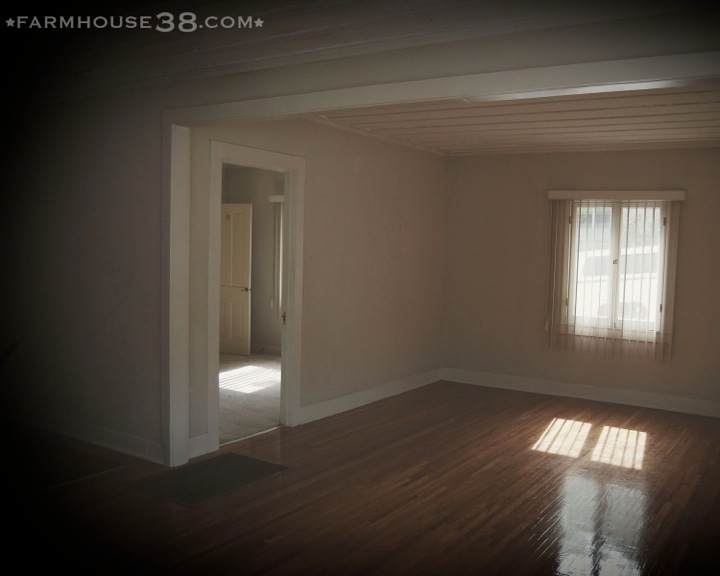 Oddly, it had a patch of perfectly polished wood floor (and if it had run throughout the entire house, I would have done backflips to save it), and though the drop ceiling was sagging and rather wonky, it was kind of cool. The apartment blinds were not cool. They just were not. When we realized those wonky ceilings were not being held up by anything other than old wallpaper, we decided they had better come down. 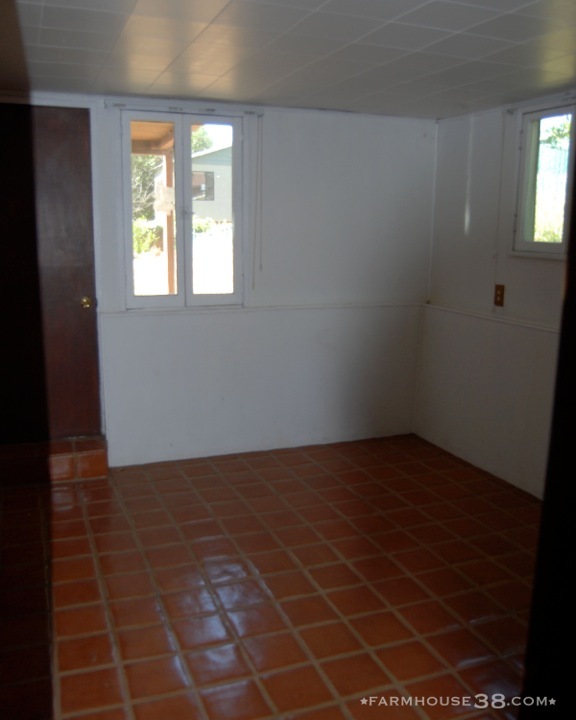 The resulting vaulted ceilings really helped open up a painfully tiny space. A brand new gas-vent fireplace helps reaffirm its coziness. So does a cuddly white dog. I like to call this a ‘soft after’ shot of the living room,as there are quite a few bits and pieces left to finish in the way of missing trim, bookshelves, etc. But you get where I’m going with this. 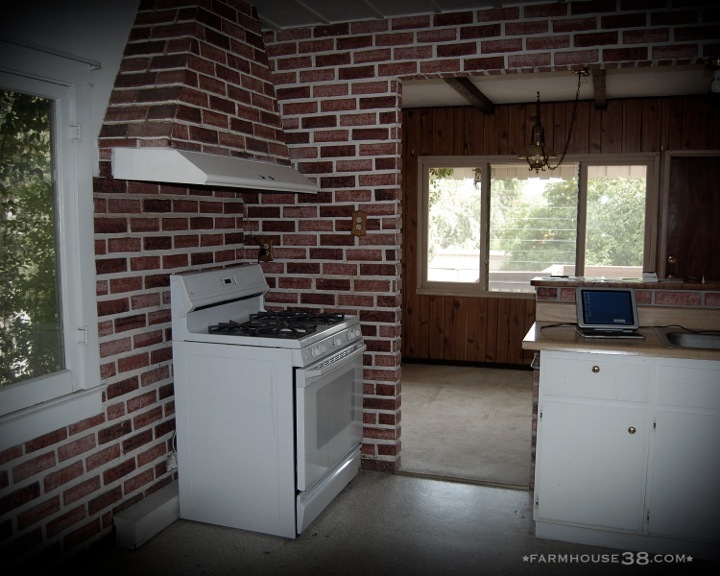 The ‘before’ kitchen was…interesting. Looking from the living room towards the kitchen, there was a ‘wall’ made of a single sheet of plywood covered in wall paper. Also, the wrought iron balcony railing and the gateway to the underworld (the hole that was actually stairs leading down to the lower story), needed to join it. The actual ‘before’ kitchen made me very twitchy. Patches of faux brick, a tiny stub of laminated countertop, and almost zero cabinets made for a pretty useless space. I won’t even talk about what we found in the fridge. Never underestimate the power of an open floor plan. 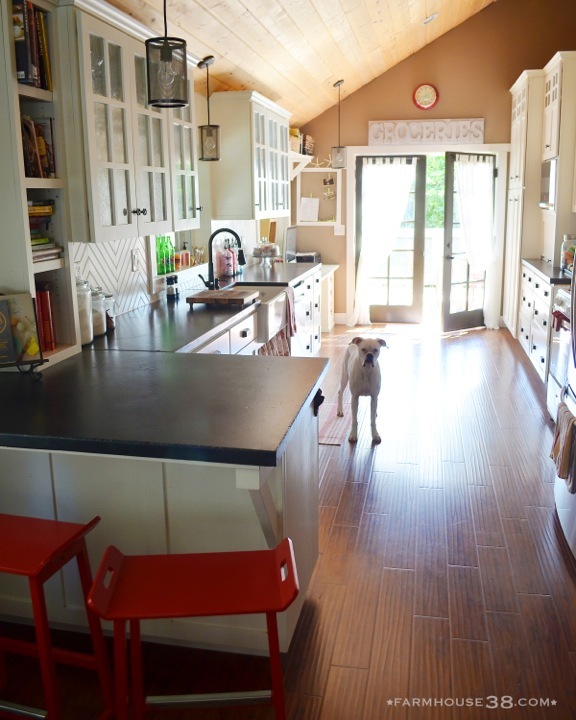 After: it’s amazing what actual countertops and cabinet space will do for a kitchen. In fact, we squeezed in as many square feet of countertop (soap-stone-inspired concrete) and cabinets as we could humanly fit. 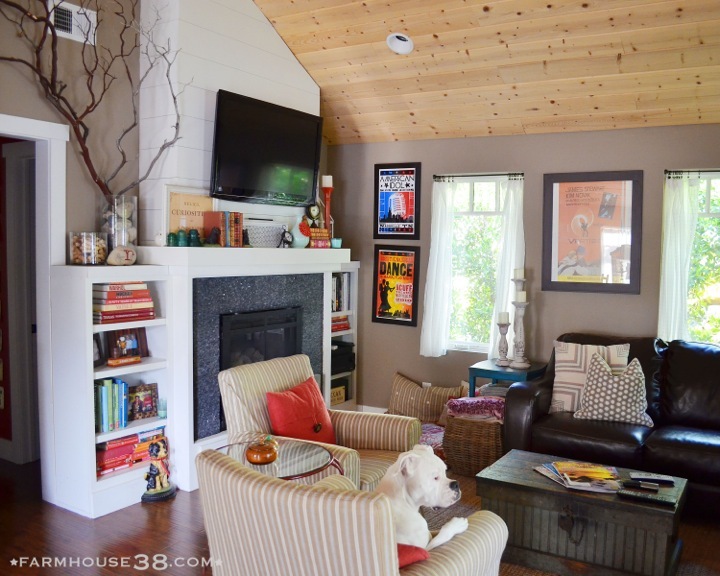 The raised ceilings, double french doors, and bead board backsplash (see how we installed it in a herringbone pattern here) really go a long way towards brightening what was once a very dark bummer of a space. 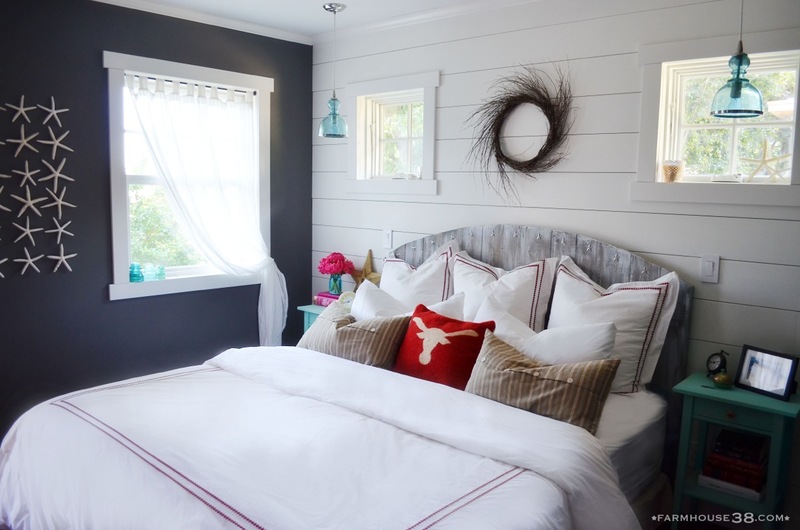 The original ‘master’ bedroom needed some serious love. It was cramped, dirty, dark and opened directly onto the living room. I sure as heck wasn’t going to sleep in there! We decided to move the master to the back of the house, where it would open onto the deck, and be filled with a lot more light. It’s still not a big room, but it’s a lot bigger than it was. 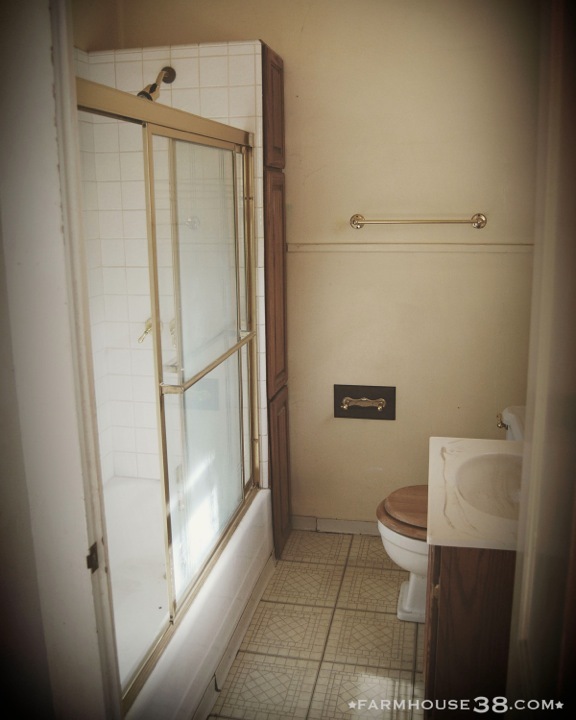 The ‘before’ master bath still haunts me to this day. This photo just doesn’t do the level of filth any justice. The bathroom stayed where it was, but got a little bit of reorganization, And some much needed added square footage by stealing the neighboring closet. 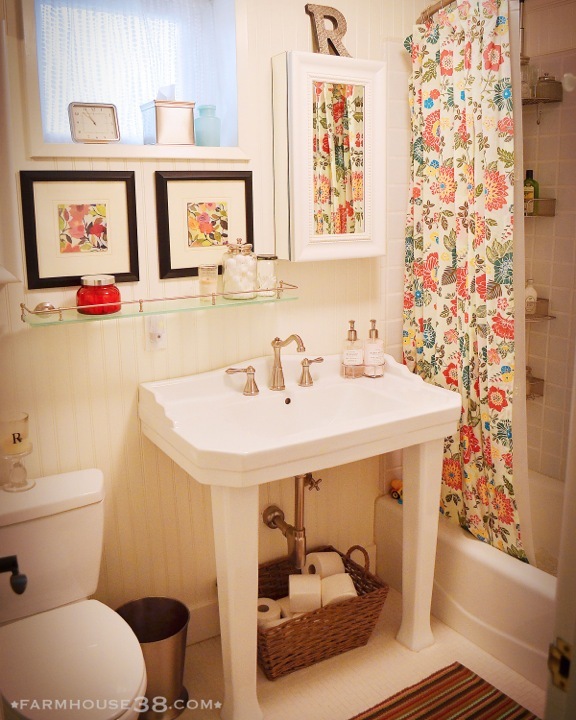 The double sinks, stand-alone tub, and walk-in shower really make it feel like a grown-up bathroom, and the endless white subway tile keeps it all classic and bright. 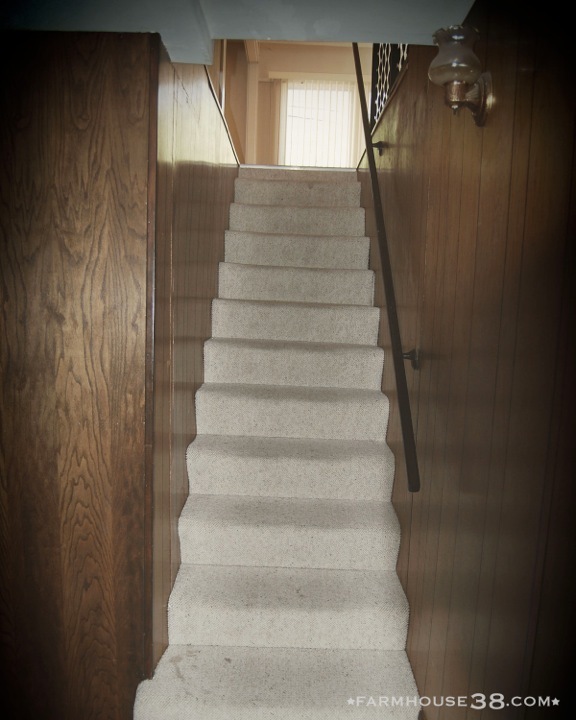 The original stairwell was straight out of a funhouse. Not a single step was level, or the same height, but fortunately the stairwell was so narrow that it kept you upright if you tried to walk up or down it. And who doesn’t love dark wood paneling and dirty carpet? After: we widened, leveled, and stabilized the whole thing, adding bookshelves along one side for some much-needed storage. 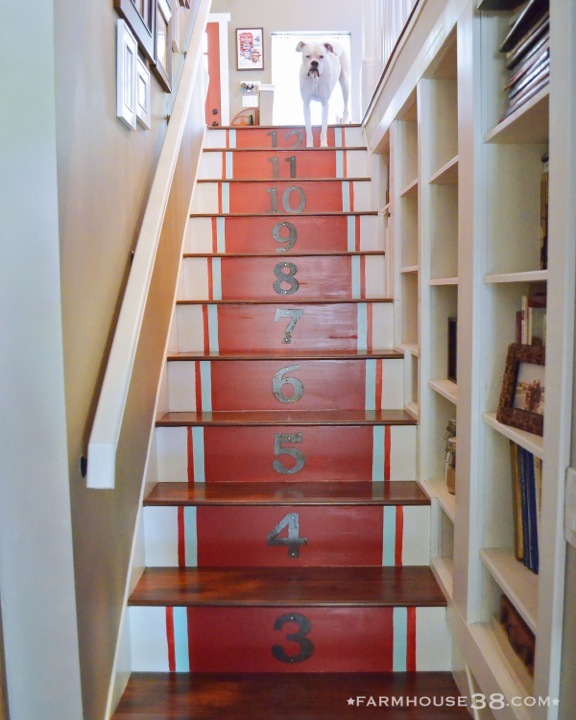 The painted runner, rusted metal numbers, and the ever-present white dog add a little extra cute. 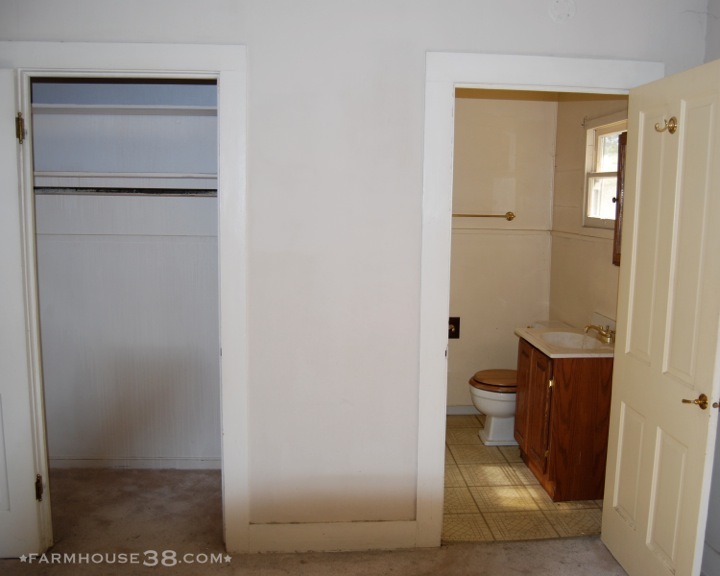 The downstairs bathroom before was another mess, complete with scummy pink tile floors, plywood walls, and, my very favorite, a wooden toilet seat. No…just no. The back deck before was known to all who had the displeasure of witnessing it as the ‘Deck of Death’. It was unfit to walk on, and, in fact, when we set about tearing it down, we realized it was barely attached to the house. 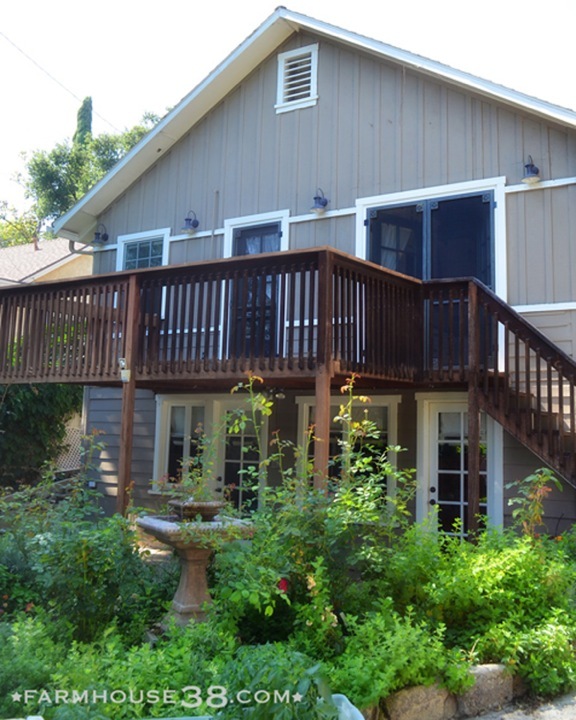 The ‘after’ version of the deck is much more functional, and much more attached to the house. 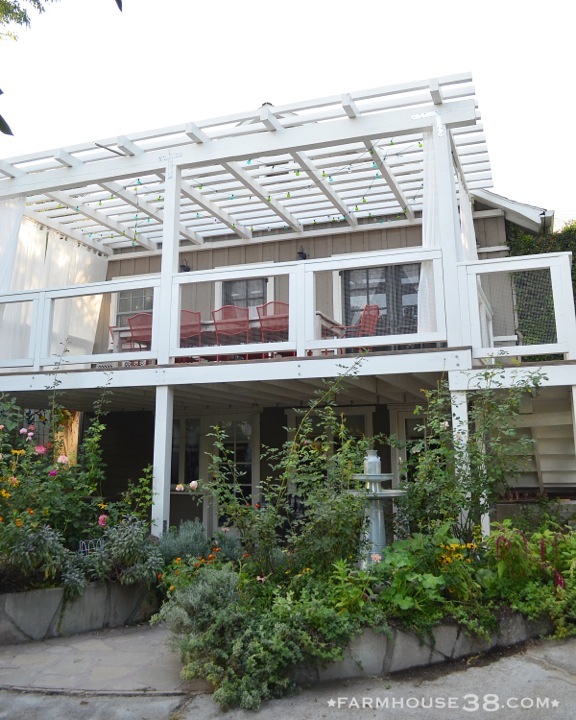 We widened it and added a pergola to shade what was once a brutally hot spot in the summer. Read more about the entire project here and here. 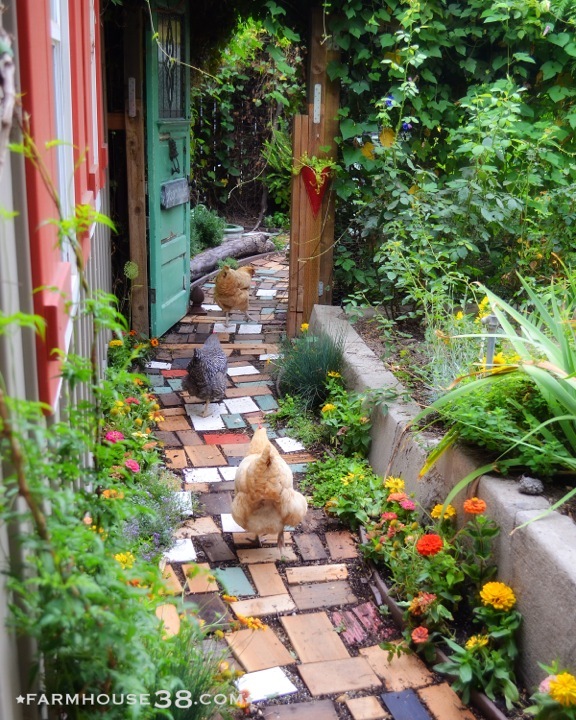 Finally, I could never live with myself if I gave a house tour and didn’t show off the hen house and chicken garden. 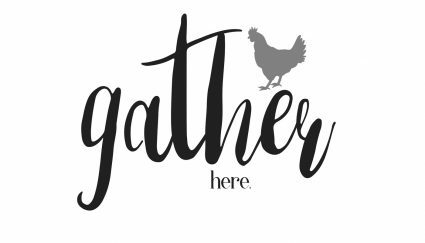 After all, what good is a farmhouse without a few chickens running amok? Suffice it to say, the entire yard, pre-renovation, was an over-grown jumble of weeds, and it has been quite a feat to get it cleared out and looking at least somewhat garden-y. pathway (look closely and you’ll see that much of it was reclaimed from the Deck of Death), back through an old door turned gate, into their own private garden. The coop (or ‘Free Range Chicken Jail’) is a snug little spot for the girls when they have to be locked up. Usually, however, they stroll the entire property like they own it. Because they do. 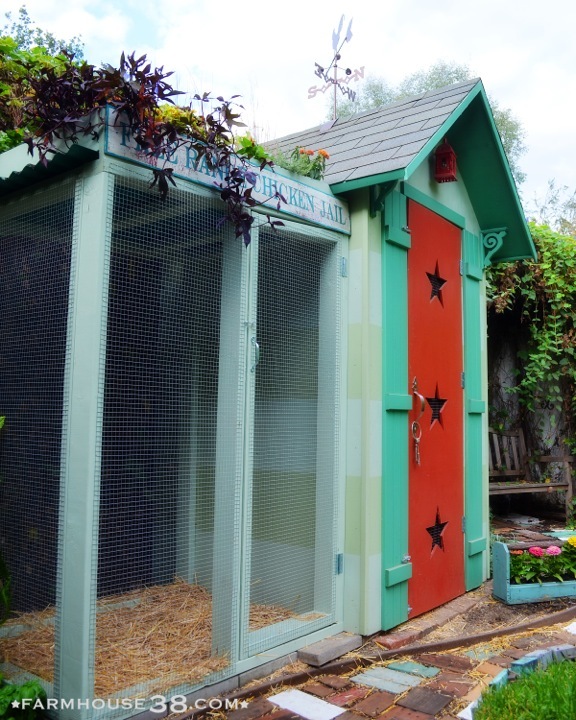 See more about the garden, coop, and chickens here. 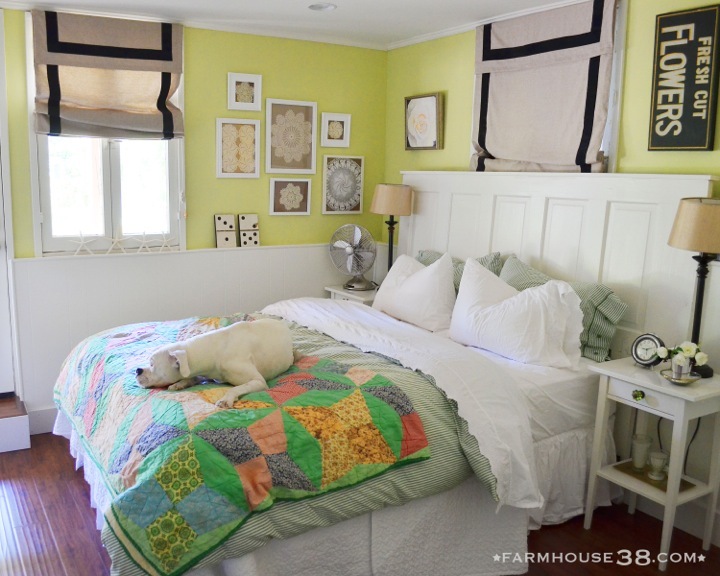 The farmhouse has come a very long way, but the renovation list just never seems to end. 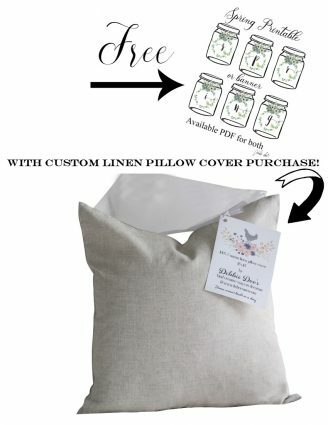 Stop in and visit us at farmhouse38.com to keep up with our on-going house projects. Stick around for the rest of our shenanigans; we craft, we cook, we cocktail, and we city-farm our little hearts out. There’s always a lot going on, but it’s ok, the animals keep us in line. Hi Debbie. It was so nice to read about Kate’s farmhouse. I could not see the pictures. Not sure if it is something with my computer or something on your end. It sounds like a wonderful updated farmhouse. I just can’t see any pictures. I can’t see them either….will have to come back later! 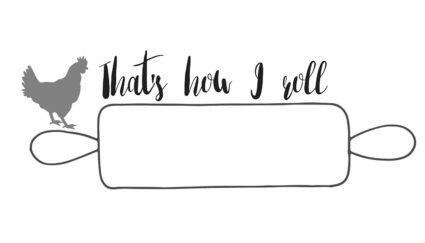 As you’ve probably heard…the pictures aren’t showing up. I’ve seen Kate’s home before, and it’s an AMAZING transformation!!! Hope you get the pictures to work so everyone can see it! YAY! Now we can see the pictures! And there are even more than what I’d previously seen! Such a vision she had…and what AMAZING results! Ugh, going to fix now ladies, sorry! Not sure what the deal is. The amazing pictures are up, Debbie….wonderful story and the transformation is awesome! Thanks!!!! I love this! What an amazing fix up. Kudos to Kate and her helpers! WOW … what an incredible transformation! They truly have “vision” and have made their house a fun and inviting home! Thanks for sharing and hope your spider bite is better! Love this home! Great tour! Oh my goodness was this a HUGE treat this morning….loved every single thing about this marvelous place….great find! AMAZING! Who knew such a dreary, drab place could be so inviting and beautiful! We have woo paneling and mexican tile in our house. I hope to remodel in the near future! What a Qt. I get you on the bathroom thing. 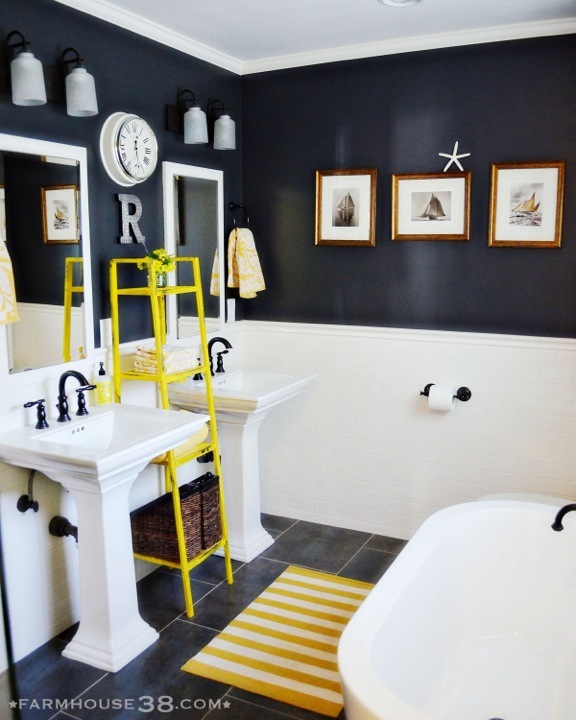 We had a frat house worthy bath in our home, pre reno. Not pretty. What a delightful home!!!! What a stunning house! I can’t wait to have some fun and really explore her website. How many white dogs live in this house? Amazing transformation! The transformation is so amazing! porch, the kitchen, the bedrooms, bathrooms, and the garden are so wonderful. 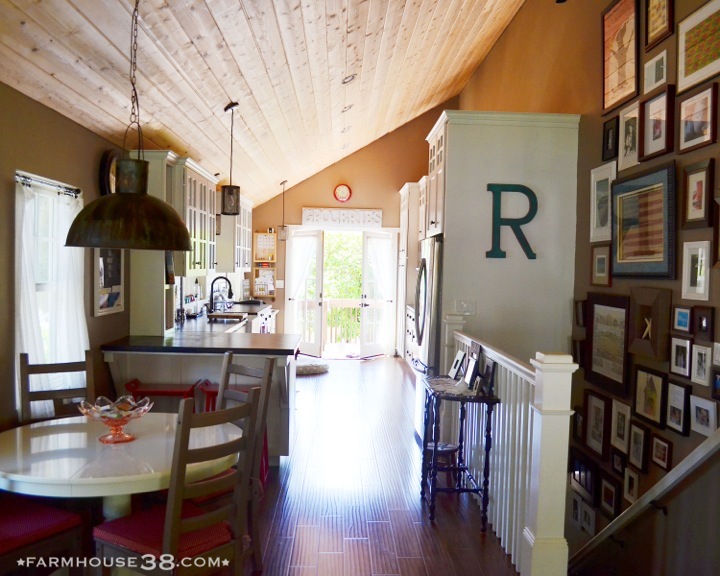 I cannot get over this transformation….truly a labor of love and it is hard to imagine it is the same house…Incredible job…the house is gorgeous!..and love that hen house!…..Kate, you and your husband in an amazing job!…thanks Debbie, really enjoyed this wonderful tour!! I know this blog! I absolutely adore this house! Such a fabulous makeover top to bottom. Not sure if it’s the Bevo pillow, but this may be my favorite house yet! 🙂 What a charming farmhouse, and a witty story too. I absolutely love everything they have done! 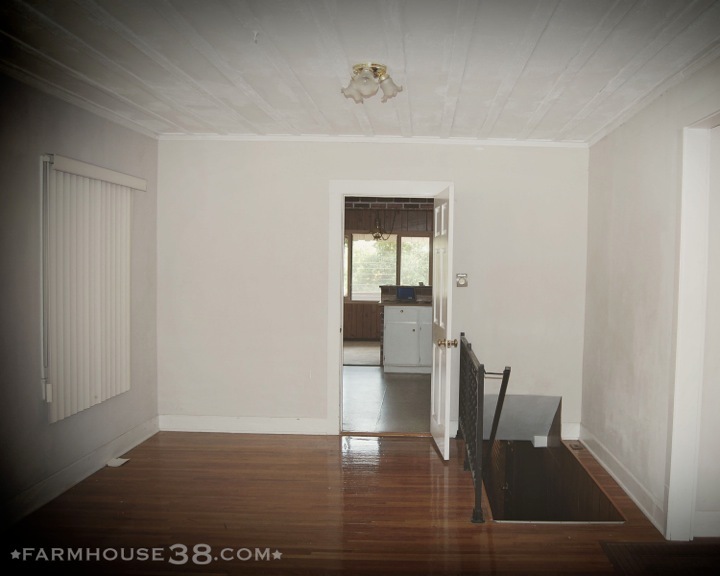 We have looked at houses this bad to reno for rentals, and now I can show Maurie this precious house and say, “See? ?” Totally love everything they have done! I just went through your site, all of your pictures showed up for me and they were delightful! I LOVE all the extra details you put in like the numbers on the stairs and the book shelves! My dad, who is 84, told me he always counts the stairs as he goes up, no matter where he is, at the top he can tell you how many stairs there were. When I saw the metal numbers I instantly thought he would LOVE this idea!!! Wonderful! Thank you so much for sharing!!! Debbie, Did I miss it, what’s the story with that hilarious Real Estate sign in the front yard? 🙂 Great home transformation! Very inspiring! 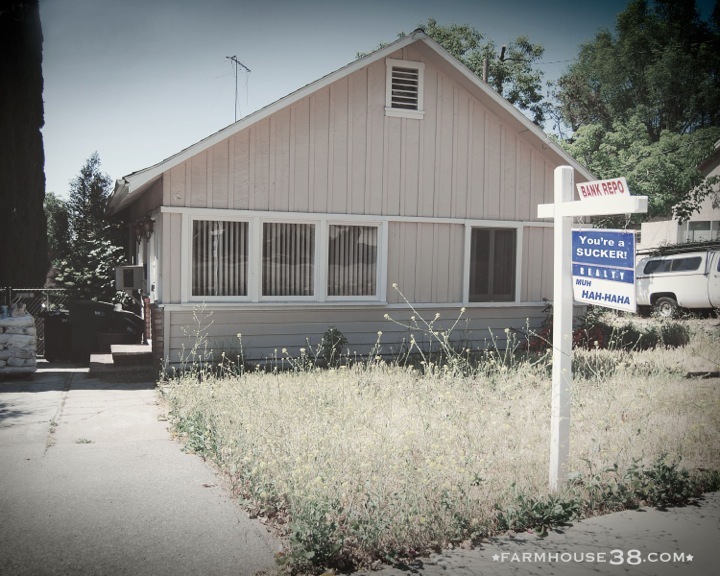 That was the before, the realty sign when it was for sale. Not sure what the backend story on that is, LOL…pretty funny though! I don’t know what kind of rewards and recognition are given out in the home renovation world, but this couple deserves it like no one I have ever seen. This is truly amazing!! I bet their neighbors love them. I would hire them to come to my house in a flash!! loved the tour and renovations. Thanks for letting me look…. Wow wow and wow I could use you to go through my house and just get it there. You did such a wonderful job. I love the guest room & the numbers on the stairs. And the chicken run! 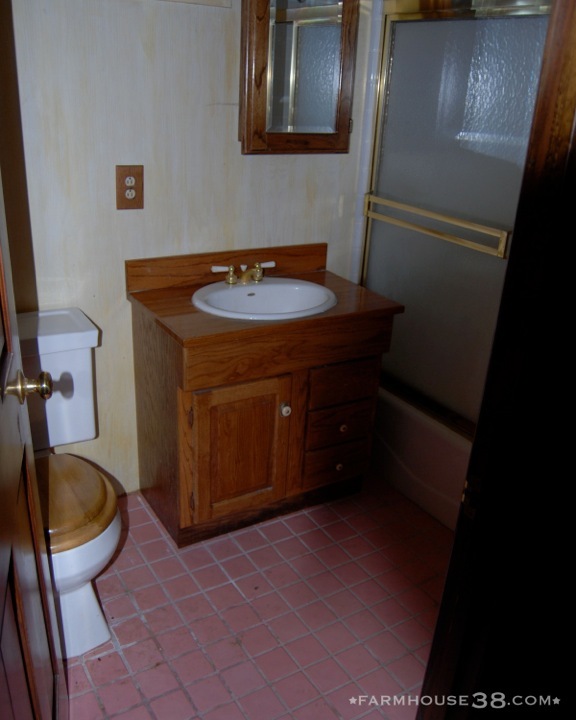 And I agree: there is almost nothing more hideous than a wooden toilet seat. Bleech! 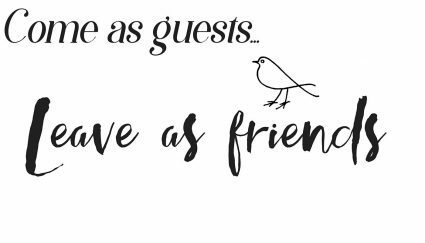 I love her home and her blog – thank you for sharing! What a wonderful tour Debbie! And what an stunning and gorgeous transformation. This is by far my favorite home tour you have ever had, Debbie! Absolutely amazing, and filled with charm! LOVE every detail! WOW! WOW! WOW! What an amazing job!! Love everything you guys did to transform the house! Truly inspir ring! Wow, this is amazing! I love your boxer doggie too! I have had the pleasure of seeing this transformation a couple of times and it never ceases to AMAZE me!! 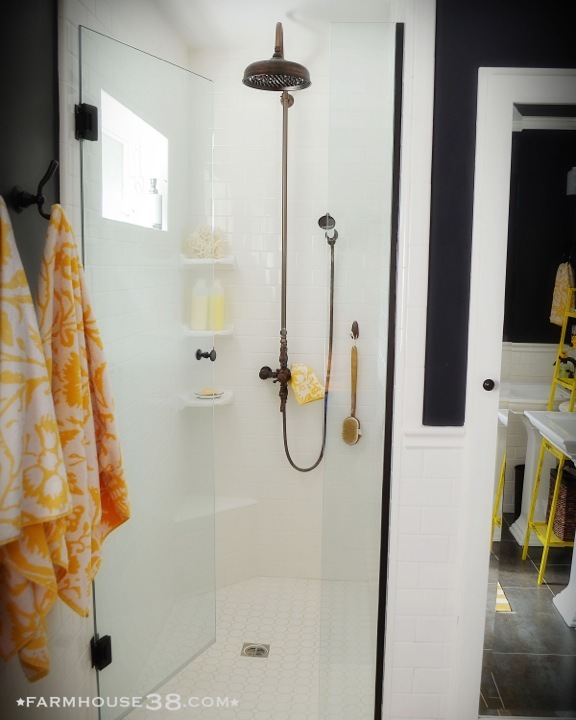 Brilliant use of space and it just oozes charm…love it! Such a cute, imaginative house! Debbie had a 2014 house fall tour and you were one of them! 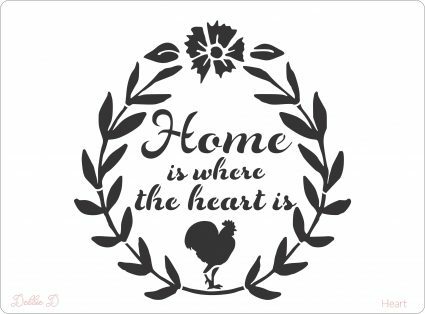 Are you still in your farm within a city home ? I really like it, wonderful transformation! We have two homes in our block that are being remodeled to the 21 century. Across the street is repo and down the street was a rental they trashed. So my friend and I make rounds going through the houses to see the progress. They workers, owners do not mind, we stop by for a second say hi! and remark on the progress. We remodeled our one and only bathrm and kitchen 2 yrs. ago. What a difference. All the house are 50 yrs. old. Wowie wow! Luuuuv the changes you made. 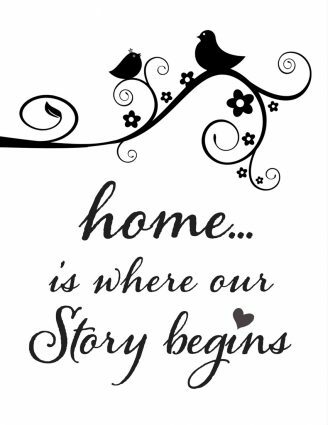 You certainly made this house a home. VERY CUTE! Thanks for sharing! Seriously one of the best re-do’s I’ve ever seen. Bravo!! When I first came across a photo of your gorgeous pergola on Pinterest, I knew immediately I had to see the rest of the house. Just yesterday my husband and I were dreaming about having one of those… We are in the process of possibly buying an old 1930s farm house, and your stunning transformation has given me so much hope and ideas and inspiration, that I’m just about bursting with happiness! Thank you for sharing your amazing vision! Love it, so beautiful! I am so inspired by your work. Great job!!! What a transformation!! Wish I was young again (30ish). I’d be sure to do something like this. It’s amazing and I love it. 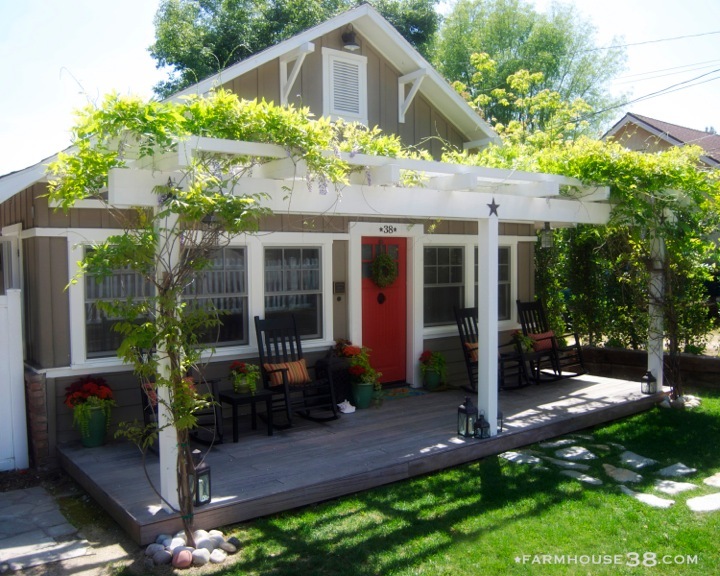 hi .. adorbs… I am wondering.. is the pergola on front of house attached or is it a free standing eyebrow pergola?